My Comment : Be not afraid to speak. This is the current situation but let me add few words only, their time will end in 2017 then hell and remember always, it’s a great honor living these dark times, your Rosary is your “weapon”, Pray it each day and do not forget to pray for me as well, thank you. By naming Archbishop Blase Cupich of Chicago to the Vatican’s all-important Congregation for Bishops, Pope Francis effectively has positioned him, in tandem with Cardinal Donald Wuerl of Washington, D.C., to be the American “kingmakers” on this pope’s Watch. Pope Francis on Thursday named Archbishop Blase Cupich of Chicago to the Vatican’s all-important Congregation for Bishops, in effect positioning the Chicago prelate to help shape the next generation of bishops in the United States and around the world. The Congregation for Bishops is composed of roughly 30 senior prelates from around the world, and is the body that submits recommendations for new bishops’ appointments to the pope. Although the final decision is always up to the pontiff, with relatively few exceptions, popes generally accept the panel’s recommendations. As a result, the Congregation for Bishops is widely considered among the two or three most influential departments in the Vatican, and generally appointing someone as a member is a sign that they have the favor of the present pope. The congregation is presently led by Cardinal Marc Ouellet of Canada, who was appointed to the role by emeritus Pope Benedict XVI. The appointment does not mean Cupich will leave his position in Chicago, although it will likely mean more frequent travel to Rome for meetings of the congregation. Those meetings are generally held on a monthly basis, though not every member attends them all. By tapping Cupich, Francis has extended his effort to put a more moderate-to-progressive stamp on the Congregation for Bishops, and, by extension, the global episcopacy. In December 2013, Francis removed several members of the congregation seen as more conservative, including Cardinals Raymond Burke of the United States and Mauro Piacenza of Italy, replacing them with twelve new figures perceived as more centrist and pastoral. Among that crop was Cardinal Donald Wuerl of Washington, D.C., who had also been tapped by Francis as a member of the drafting committee for the final documents of his two Synods of Bishops on the family. At 67, Cupich is poised to be a member of the Congregation for Bishops for a long run, potentially until he turns 80. Although each member of the congregation gets a vote on every bishops’ nomination to come before it, the informal practice over the years has been to defer to the members from a particular country when a position opens up in that country. During the Benedict XVI years, that practice often meant that Cardinal Justin Rigali, a former secretary to the Congregation for Bishops, was effectively the American “kingmaker,” meaning the prelate with the most behind-the-scenes influence on bishops’ picks. Today, Wuerl and Cupich seem positioned to play that “kingmaker” role under Pope Francis. Since becoming Pope Francis’ surprise pick for Chicago in September 2014, Cupich has carved out a profile as a leader of the moderate-to-progressive camp in the Church. During the 2015 Synod of Bishops, for instance, Cupich distanced himself from some of his fellow American prelates who had expressed concerns about the synod process, and also called for greater inclusion of “marginalized” groups in the synod’s deliberations, such as gays and lesbians. Cupich also suggested support for calls to allow divorced and civilly remarried Catholics to return to Communion in individual cases, following a process of discernment. In the wake of the recent Orlando massacre, Cupich was among the American bishops who explicitly mentioned “our gay and lesbian brothers and sisters” in his statement on the attack, calling for stepped-up efforts to promote tolerance. Cupich, who’s of Croatian ancestry, is a native of Omaha, Nebraska, and previously served as the bishop of both Rapid City, South Dakota, and Spokane, Washington. My Comment : Time to resist them. I don’t know if you have noticed, but there is no longer one single counter-current voice in the [Italian]mass-media which reports truthfully what is happening under the Bergoglian regime in the Church. We are under an oppressive Argentine dictatorship. Those who disturb the Bergoglian Power would appear not to have any right to speak in the media. Even the most important Catholic intellectuals, who criticised Amoris laetitia severely (such as Spaemann, Grygiel and Seifert, close collaborators of John Paul II and Benedict XVI) have remained invisible in the [Italian] media. Their severe criticisms have been silenced. Even the explosive discourse of May 21st by Monsignor Gaenswein – Benedict XVI’s secretary and right-hand man – is virtually unobtainable in the media. Just like the critical voices of some theologians, bishops and cardinals. TOTAL CENSURESHIP. SOMETHING NEVER SEEN BEFORE. IS IT POSSIBLE THAT WE HEAR NO VOICE RAISED IN DENOUNCING THE DICTATORSHIP IMPOSED IN PRAISE AND GLORY OF THE “MERCIFUL” ARGENTINE? We still have the net – it’s true. Thank heaven here it’s still possible to write and read the factual truth. And already some Bergoglian clerics are launching anathemas at the net itself, since they are unable to control it and impose their muzzle there as well. A friend has observed that it’s very sad indeed as this Argentine dictatorship is being imposed without the least critical reaction, not even on the part of the laity. Yet, this is an ingenuous observation as it’s precisely the lay secular-media that are the most unrestrained supporters of Bergoglio. They have finally found the one in whom they can realize their dream: the destruction of the Catholic Church. So it is quite obvious they are skinning their hands in applause and in support of him as they silence the opposing voices of the Catholic Resistance. There is, however, some news to add to this: the Resistance shall win, because Christ shall win. You can be sure of it. It shall not be heresy and apostasy that prevail. Even if they have all the earthly power today. Today it seems those who want to liquidate the Catholic Faith are winning hands down, but the King of Heaven will make visible the triumph of the Immaculate Heart of Mary. For this reason, today, we appeal to Our Mother also for the conversion of those who are oppressing the Church and collaborating in the destruction of God’s work. We pray for the persecutors, for the salvation of their souls. And let us pray to Our Lady, that She may protect our souls from falsehood and cowardice. Let our entire life and selves be under the mantle of Her Maternal gaze. We entrust everything to Her, She, Who is the Help of Christians and the Queen of Victories. My Comment : Let’s Pray. In response to acute priest shortages around the world, Pope Francis may well decide that his next Synod of Bishops should focus on ministry — including the question of whether married men could be ordained to celebrate the sacraments, in effect creating a parallel priesthood. But the timing is very interesting to me as this new Synod will be the 18th, let me go back few years ago when I was informed via some sources of an important Synod before the Garabandal Warning (the Video Below) then it became a fact around the Net, that time I thought it could be the last one (2014-2015), the so called Synod on the Family, in fact and as we know today, the main focus was about the Eucharist, then I was informed later as indicated online, that we could have 1 more and probably the last one, so the next one according to some leaks could be about Prieshood, strangely after the Eucharist yesterday so probably Prieshood tomorrow, the 2 main topics in Garabandal via the Lady of the Carmel, so if confirmed, we may have the prophesied Synod with the calendar just ahead and matching by “the merest chance” my own calendar as well, thank you. Hi Aviso, see the attached One Peter V link re: alleged Pope’s letter endorsing Eucharistic sacralidge. Steve Skojec implies help in Spanish translation would help get to the truth of the content. Any ideas? In short a new confirmation of what we already know and since the beginning of this pontificate, a punishment from God to all of us, this will end badly for the Church as for the World and exactly as indicated in the Fatima 3rd Secret vision, probably soon now. I am Absolutely astounded by the complimentary comments of Cardinal Marx concerning that dog of a heritic, Luther. I am utterly offended once again by those I hope to receive clarity in these dark times, how dismayed and insulted must faithful priests and Bishops be feeling right now! God bless and prayers, especially for our Priests. Hi Aviso. Let me take advantage of your knowledge. One of the things that I would like to know is about the relationship (if she ever had one) between Sister Lucia and Conchita. Do you have any information? Father Gruner : The Fatima Priest, we own to him the main Fatima Apostolate, the Fatima Crusader, considered by most as the most-inflential and powerful Fatima Movement in the Catholic Church, without his Great Work for years (about 40 years), most of the faithful will have probably never heard about Fatima, except the official version from Rome only, the Fatima Priest was in Garabandal in 1965 and it’s from there in the Village that he was handed for the first time, literature about the Message of Fatima. These 2 great Priest and Bishops are a gift from the Lady of Mount Carmel to the World, be sure of that, the other one was probably Malachi Martin. In short, any one beleiving in the Fatima Prophetic messages without beleiving in our Lady of Mount Carmel cannot be taken as serious, you cannot beleive in Garabandal without Fatima as you cannot believe in Garabandal without Fatima, the rest has not any serious value or the necessary knowledge to understand the full puzzle, as I said online, our Lady came back in Garabandal because of Fatima as she came back in Akita because of Garabandal, these 3 Marian Apparitions are linked to the Apocalypse and the end of times period, I will give more details in my Fatima 3rd Secret soon. By the way, Conchita has her home in Fatima as well, I was in Fatima myself few months ago only and will be back there soon, I can also confirm without any doubt many different meeting between the Garabandal seers in Fatima as well. Hi friends, I recommend you to watch: Fr. Martin: 3rd secret of Fatima, “Apostasy&Chastisement” on youtube. Fr. Malachi Martin read the 3rd secret when served as secreary to Cardinal Bea. He confirms that Garabandal repeats the 3rd secret’s events. One of the remarkable things that he says is: the events will occur not in 100 yrs, not in 50 yrs, and not even in more than 20 yrs. It was said in 1998!!!!! So, Aviso could be right to pick up 2018 as the warning year!!!!!! Even though it is going to be a very frightening experience, I am looking forward to it…. Hi Juan, Malachi said it in 1997 not in 1998, he points out especially the Year 2017, probably the most difficult year for centuries (I call it the year of Russia) as I said online then the Warning in 2018, probably the good scenario with a probability close to 90% according to my research, the small doubt is the year 2019 with a probability of 10% only, could I be wrong ? maybe but unfortunately I don’t think so. And remember, The Year 2018 is exclusive to this blog only, thank you. Hi Aviso, I very much appreciate your information. I thought that since Conchita had bought a flat in Fatima, and she had a friendship with bishop Venancio, she should have had some sort of relationship with sister Lucia also. It’s really amazing the world knowledge about Garabandal, with the exception of Spain. If it is not by a direct action from heaven, Garabandal will not be accepted by the Spanish Catholic Church. Anyway, at this time persecution against it seems to have relaxed a little bit. In this country very few people know what happened in this little village in Northen Spain. In 1993 I was translating into Spanish the books of a Greek seer called Vassula Ryden. In her talks with Jesus (True Life in God) He said to her: Garabandal is true. At that time she was in Bangladesh and she had never heard that name before and let alone where it was. Vassula said to me when she came to Spain in that year: Have you ever been to Garabandal? And I said to her: I never heard about that place before reading it in your books…. In 1995 I was fortunate to spend a week at Serafin’s house (Conchita’s brother). Since then I have been spiritually bond to Garabandal and God willing I hope to be living there in a short time. In the last 20 years I have been with Father Gobbi (founder of the Marian Movement for Priests) several times. Our Lady also talked to Fr. Gobbi about Garabandal and the warning, the miracle and the chastisement are well reported in his blue book. It is amazing how many spiritual figures of our time have believed in Garabandal. Serafin’s wife told me about the day mother Angelica popped by her house in the 90s. The poor nun was taken to the pines and a great down pouring occurred. She was all soaked up when she came down from the mountain. There is no doubt that mother Angelica, who recently passed away, is going to be a future saint. I am afraid that the huge apostasy that is suffering Spain is the result of having rejected Our Lady in Garabandal…. I plead her to forgive our nation. Correct me if I am wrong Juan, but both the Vatican and Greek Orthodox Church hold that Vassula Rydan’s writings contain doctrinal errors and the faithful are advised not to attend her seminars, prayer groups and gatherings etc. There is also controversy in regard to links with Medjugorje, the New Age Movement, Charismatic movement etc. Hi Pete: I have to tell you that I am not especially gullible. In my opinion 99.9% of the reported seers today are most probably false seers. But I also think that we have to study them and meet them before reaching such conclusion. In my job (I am a physician) I am used to deal with agnostics and atheists all around. If we go back to the history of the Congregation for the Doctrine of the Faith (CDF) we can find plenty of alerts and even plain condemnations of true seers (remember Sister Faustina, Padre Pio, and many others). I am not going to argue about Vassula Ryden. In my opinion, the chances for Vassula being a true seer are pretty high and the recommendations of the CDF are just that (recommendations), but not condemnations. Many theologians (read the book about her by Fr. Laurentain), as well as many priests, bishops, cardinals and Orthodox Church clergy support her, and I follow the recommendations of Pope Paul VI about approaching these manifestations with an analytical view and take the good things. It seems that you also judge Medjugorje and the Charismatic Movement. I do not agree in any way. Before judging Medjugorje one must go there a few times (nine times in my case, the first time during the war) and evaluate the events from within. And everything else of same kind. In other words, be sure that my popularity with these kind of advices should be currently at the Top, thank you again. As Casaroli, Bugnini, and Vilot had to come out of their bodies and be judged so Danneels will one day come out of his body. When did Antonio Socci post that on his twitter account? Was it before or after Benedict’s bizarro 65th Anniversary celebration? You don’t suppose the Anti-Christ is already in his place of power, in plain sight, right before our very noses? So more about the anti-Christ in the Apocalypse, especially Chapter 13 and Verse 18, strangely 2 numbers quite known to us, by the way Sister Lucy told us that the Fatima 3rd Secret is in the Book of Revelation, From Chapter 8 to Chapter 13 (probably another coincidence), she even added, read them. Laudetur Jesus Christus.Aviso, what do you mean by the “years of purification?”I thought that after the Warning and Miracle ( that should happen when the things are at their worst ) there will be three years and half of persecution by the Antichrist.Where did you get that information from about 12 years of purification?! Hi Frank, even the Fathers of the Church do not agree among themselves about the anti-christ and the timing of his coming, today some think before the era of Peace indicated in Fatima some after, according to my information, the anti-christ is already there, let me be clear, everyone knows my great Respect for the Late Father Gruner, the Fatima Priest, Father himself thought after the era of Peace only, I do not share (it’s very rare) his opinion, as I did not share with him, the Rumor related to Father Amorth telling him we may have 8 months not more, I debunked this Rumor myself reminding my cautious about Father Amorth and his timing, so in my opinion and again Garabandal is the Key to me, the anti-christ is already there, do not think a second that after the consecration of Russia, the entire world will become Catholic within few months, to me this should take 12 Years approx. I recall Fr Malachi Martin S.J. in one of his interviews, confirming the Anti-Christ was indeed alive. I understood this to mean ‘alive in the flesh’ and awaiting his chosen time. Maybe useful to remember that at the time of the Warning the visionaries have told us things will be ‘very bad’ – ‘at their worst’. [ Katechon; “man of sin”, eschatological; relating to the end times ]. A Communist Prelat with the cult of Personality. I thought the Anti christ may be a muslim coming from the middle East. Thank you again Aviso, I fully understand now. For 35 years I have retained my beleif in the messages of Garabandal and their link to Fatima but never quite got the full picture of how events would ultimately play out. In all that time of my sharing the story of these apparitions with others, none that I know have taken to heart any of Our Mother’s messages or were moved to action. I had thus resigned my self to at least assuming some good seed may have been sown, so when the Warning was experienced, they would remember what I had said and understand the event as an act of Divine Mercy toward them. I have felt quite alone on this battle field until I came across your web site, and now I see I have brothers in arms at my side. I don’t want to be overly sentimental but you will never know what it means to me, your being there with your companions, contributors and supporters. Thank you Aviso for the prompt response and clarifications, very helpful and certainly not a scenario I had considered. The situation in the West, I absolutely agree with you and recognise as a society surgically removing God from all spheres of its citizens’ life, an evil liberalist communism in every sense of the word and already persecuting those who oppose its agenda. It will ultimately lead to protests against Orthodox Christianity, desecration of some Churches and prosecution of loyal Priests and laity who openly oppose such an agenda: a conflict of ideas in morality, human rights and equality directed by Satan against God, His Church and The Blessed Virgin. Countries enforcing Marxist Communism I have assumed to be another battle front from which God, His Church and the Blessed Virgin are under attack, ultimately leading to a war of territorial expansionism that will enforce adherence to Marxist ideoligies across Europe and ultimately the most bloody and violent in places of its occupation. The third battle front being Freemasonary, which is a form of pseudo theology that is simply communism in another guise. An attack from within the Church that has shown its hand to those who see, one of stealth for the majority. An attack that is the most subversive, corruptive and influential in its potential to lead many souls to perdition. Aviso I truly hope your words and insights are right, She, the Bride of Christ needs a friend, watching, ready to intervene, a place of safety prepared. In the meantime, we Her children have our remedy, The Blessed Virgin, our weapons, the Holy Rosary, True Adoration of the Holy Eucharist and the daily sacrifices we offer in reparation and penance. Hi Pete, this is probably the good scenario, if I was aware of the coup in Rome (still in progress) from the beginning (probably one of the first online), I let you imagine what the FSB knows as well, anyone promoting what we call the « gender » agenda (the most evil idea for centuries, the so call, Green, Gays and co right) are not allowed in Russia (Pope included), to me there is not any greatest promoter of this agenda than the current Pope himself due to his position, the Pope of the Fatima 3rd secret in other words,, when Bergoglio in 2013 was elected, within few minutes, the main intelligence services of this world (Israel, USA, UK, France, Russia and China) had already on their desk, the Past and all the details of Jorge Bergoglio life, before to become Pope, we should not forget that he was Priest then Bishop and Cardinal, by analysing his actions in Argentina, you know within few minutes what this Person had in his mind, which explains why the main Promoter Countries of this agenda (USA, UK, Europe) are very happy with this Pontificate as their medias. Kirill, the Patriarch of Moscow is a close friend of Benedict for years, any trip of Pope Francis in Russia will be a good news but, I cannot garanty if he will be able to come back in Rome, so to me there is no chance for this trip during this pontificate, the mafiosi group are intelligent as well, in saying this I have already saying everything. Aviso. Ref to your question: ‘Pope’s return.’ I have read on one of your pages that you debunked this, I just can’t remember where without reading through it all again. I take it you are referring to a statement said to have come from Conchita during an Interview with Albert Weber at her home on November 14th 1965? I have seen others refer to this and is supposedly recorded in his book, Garabandal – De Zeigefinger Gottes. I have not read this, it is commentary by others taken from this resource that I have alluded to. Aviso : I debunked this mistake in many head for years on my first blog, with the help of a friend from switzerland, speaking fully german and who knew Albrecht, he had with him his first book (90’s) and with me I had the one sent to me by Albrecht himself, his last updating book (2000), this Rumor is not in Albrecht book, only the prophecy of the 4 Popes, so I cannot confirm this Rumor, it’s not I don’t want that this Rumor might be Truth but this is not from Albrecht, I am known to work and for years on facts only, with a verification in the village and sometimes a double verification with different sources and eyewitnesses if necessary and always at the source, so most of the time in Garabandal directly. Our Lady Comes to Garabandal – Including Conchita’s Diary, by Joseph A Pelletier. The Apparitions of Garabandal, by F.Sanchez – Ventura Y Pascual. The Devil’s Final Battle, edited and compiled by Fr. Paul Kramer. And of course your web site and those you refer readers to. Aviso : These Publications are good and can be trust, avoid at all costs the Garabandal Book and anyone refering is Supposedly knowledge about Garabandal mostly to this Book, the authors were French and used their own opinion especially about the last Council with the Garabandal Prophecies, half (approx.) of this book is Truth, the over half personnal opinions only. Aviso : here as well, when Loli told about Communism enter into the Church, she means when the errors of communism (as indicated in Fatima) will reach even the Church, the conséquences of these errors will be a Great Punishment, especially when the Pope himself will be concerned, we can find the same warning in the Fatima 3rd Secret as the last Pope before the Consecration will be Under the control of evil forces or Under the control of satan according to others, in other words a communist Pope, this will be the beginning of the Great Punishment. Clearly the consequences are all the errors, confussion and divisions that are beginning to unfold now and the calamitous events that are yet to be realised. Given that Russia, as attested to by the Seers is to be instrumental in creating a dreadful state of affairs prior to the Warning, and you advise this will be before April 2018, then I don’t see how in the remaining time Putin might assume a benevolent rather than malevolent posture toward the Church and the West. If you have information that sheds light on the next 21 months, that supports or is contrary to my assessment I would be most grateful. Aviso : Putin will not Attack Rome, Daesh only and especially the Vatican (which means the CIA probably during the mandat of Hillary) when Rome will be Under the chaos as described in the Fatima 3rd Vision, the last solution for the Italian Gouvernment will be to call Russia with whom they had always very good diplomatic relation then Putin will send his army to deliver Rome, not the USA or any other European Countries, these latter have not the military capacity for this kind of Military operation. The Year 2018 is the best and possible Year for the warning to my knowledge, in 2020 it will be already too late for this world, this is my conviction after years of different contact and analyse of the general situation, the Year 2017 will be the Key Year if Nothing important happens in 2017 then my timing will be wrong as well but I don’t think so. Hi Pete, my replies under each of your questions, thanks. Mikhail Gorbachev, whose time as Soviet president saw the Cold War end, has strongly criticized NATO for escalating tensions with Russia in the alliance’s summit this week. NATO’s leaders on Friday announced at the summit in Warsaw plans to beef up alliance forces in Poland, Lithuania, Latvia and Estonia, all of which border Russia. Moscow earlier this this year said it would put more troops along its western borders, including two new divisions. In my view, it could break out earlier than in 2018. After reading your last comment an idea has struck me.I think we should start a lay resistence movement aimed at forming the underground Church and petitioning some bishop or cardinal to DIRECTLY OPPOSE Pope Francis! !They just can´t go on being silent and let all kinds of heresies being spread out.We should form a group of Catholics who are ready to fight and help each other.We would write up a Credo and all of us who wanna belong to this perennial Catholic Chuch whould sign up for it.We´d keep in touch and form a Resistance Movement ( we could ask bishop Williamson to head our group if Burke or Schneider are frightened. ).I shall see him in the near future, God willing. In October they´ll “force” us to pray ecumenical heretical prayer before Mass in which Luther is praised and reformation extolled.This prayer aims at uniting Catholics and Lutherans into one flock ( denomination ). May the Lord protect you. Hi Frank, I was already contacted for the same idea few months ago, I decided to wait a bit more but the last heresy from Francis about apologizing to the Gays killed my last hope, so let me pray about it and a first act of “resistance” could be announce on this blog next week, no time to waste anymore, keeping in touch about this topic soon, thank you. I have been surprised by the increasing number of comments across varoius traditionalist Catholic web sites that seem to be warming to Putin as a positive influencer toward the Consecration of Russia. I remain to be convinced that such a sentiment toward him is well placed. Basto’s point is sound, additionally, Putin is a Communist, as such, he undermined the Country’s fledgling democratic process, boasts that he still holds his Red Book, is historically KGB, is ambitious for a greater Eurasia, has invaded a Sovereign country without just cause, is a destabilising influence in Ukraine, is creating concern in NATO countries regarding his desire to repatriate Balkan states, is a supporter of the despotic murderous Assad regime, is culpable in regard to a number of political assassinations and has virtually congratulated the abominable behaviour of Russian football fans etc. I am confident others can relay many harrowing stories concerning Putin’s regime and his disposition toward those who do not comply. I may be wrong but I think it is implicit in Basto’s comment on the chronology of prophesied events, that the Consecration can only occur after Russia has made Her move, not before. Remember, Russia will act decisively after the Pope’s return, thereafter and over a period, things will escalate to their worst, then the Warning, then I believe the Consecration, then the Mirracle, then the Conversion of Russia, then the Time of Peace. The Warning and Consecration will bring about the cessation of persecution and war. Fr Grunner’s repeating what he has heard is not in question, but perhaps the reliability of the source should be. I advise caution in this matter, the intention of power in Russia remains duplicitous. Filth has infected the most influential Governmets of the World, their laws, their ambition, their education systems, their citizens ideoligies. The Smoke of Satan is billowing in plain sight through the halls of the Church, confussion and division is on the increase, the final battle (family and marriage), between the Virgin and the Dragon is gathering pace toward its crescendo. In regard to the Time of Peace, I would be interested to hear you views Aviso, something positive to reflect on for a little while. Hi Peter, about Putin, you are repeating Nato’s and mainstream medias propaganda, Father Gruner did not repeated what he has heard but works for this result, this is completely different, it’s like saying we are a Rumor mill only, which is not the Truth,whenever I will have time I will write an article about the current Geopolitical game..
By the way, remind me what do you mean by Pope’s return ? to me it looks that many of you have only one book about Garabandal or what ? I debunked this Rumor 1000’s times but will not do it anymore.. Very weird year…i mean this year…have you heard about “STORM HEAVEN ROSARY CUSRADue UNDER THE FLAGSHIP OF CARDINAL RAYMOND BURKE”? Please join Cardinal Raymond Burke s storm heaven rosary curasde. Cardinal Raymond Burke offers a special Holy Mass on the First day of each month for the rosary warriors and their intentions. About more than 15,000 rosarians already joined with Cardinal Raymond Burke. We pray for our Catholic Church. Just offer one rosary for his intentions and ours too on the first day of each month. Thanks Marie for the reminder. July 2, 2016, the Washington Post carried an interesting Editorial entitled, “The Pope’s Welcome Surprises”. The Editorial is short and can be read in a few minutes, and what follows presupposes acquaintance with the Post Editorial itself. That this Editorial is written is not a particularly great “surprise”. It reveals, in my opinion, just how responsible non-Catholic observers understand what the Holy Father has been saying and doing. Whether they have him exactly right can and should be debated. Under Pope Francis, the Catholic Church now, in principle, accepts the liberal/humanist concepts of modern morality and justice. This view emphasizes state authority (positive law), unlimited moral freedom, theoretic relativism, and universal tolerance. Francis has not yet formally managed infallibly to install these principles–such as the feasible goodness of divorce, the gay life, abortion, and the denial of any dogmatism or rigidity. He is a severe critic of inequality in all forms, a champion of the downtrodden. He approves ecology’s concern with earth’s dwindling resources. He is systematically working his way through these issues and will, no doubt, soon define these concepts in formal ecclesial terms. This ‘Francis’ revolution in the Catholic Church is unexpected but welcome. It is long overdue. The old order of doctrine, tradition, and unchangeable moral principles can gradually be set aside. This new freedom and scientific understanding of the Catholic Church are what we now witness in the memorable words of this Argentine pope. They come from the last place from whence we might expect the long-awaited modernization of this venerable but stubborn institution. Again, this is how one man reads the minds that composed the Post’s Editorial. I take it to be a fair interpretation. As such Editorials on the intentions of Pope Francis multiply in the world press, it seems to be up to the Holy Father to clarify himself for the benefit of everyone. Because of the high profile of this Post Editorial, I do not think ‘the Vatican’ bureaucracy can any longer perform this clarifying task. In this sense, the Editorial is welcome as a basis of deep reflection about the nature of the Church. My Comment : and all this in just 3 years (2000 Years of Church Traditional teaching in garbage, may God forgive my words) , give to this destroyer 2 more years (but he will not have) and the Holy Catholic Church, the Body of Christ, our Mother Holy Church will be a new branch of those Thousands other Protestants Church, I personnaly did not joined the Catholic Church for that and even if I am alone, I will resist them to martyr if necessary. Padraig from MOG coming out : Pope Francis is heretic………. Ok seriously, Basto about your question, I have some details, we wil need Putin, I can’t give more détails but it’s about the Fatima Vision, stay tuned. I have to say that I really don’t find any fun on that. I don’t know anything about MOGF, I haven’t been there long enough to have curiosity about what’s going on over there, besides that I was probably the only forum member that started to be judged before I have even posted anything there. Anyway, I know you have many readers from there so, if I have ever offended anyone there who is reading this comment, I hope they will accept my apologies. I didn’t have the chance to say good-bye. Regarding to news about the conversion of Mr. Putin, the Russian Orthodox Church and that nation to the Immaculate Heart of Mary, if you have anything to shows us – as you say – “now it’s the time”. That’s the ONLY hope we can have in the avoiding of what’s coming fast in our way. Any links from reliable Russian official press would be great. Until then we have to carry on with the Interfax, Ria, RT, Tass and other “Mr. Putin’s friendly” Russian based journalism. Hi Basto, you were judged because you were from my blog, so supposedly close to me which I can only deny, so now move on, thank you. Fine Basto but don’t get me wrong, you will have always my Respect. As I told you, I know for sure via the Fatima Center that Putin talked about Fatima during his last meeting in 2013 with Francis, Father Gruner himself confirmed it, Russia has also its Embassy at the Vatican but some détails cannot be published online, Putin as the Rock looks open for a Consecration of their country to our Lady as requested in Fatima, we own this change to the Fatima Priest (and the first Garabandalist) and his team who worked for years for this result by convincing the Russian that a Consecration of their country as requested from Heaven is an honor and not a submission of the Rock to Rome, their conversion then is in the hand of God. From some contact, I god some new détails, not well known, The consecration will be done but not by the current Pope, a heretic will never have this honor (althought everything is possible with God, even a Miracle), this consecration will not be possible in Rome because of the war and chaos that time, only 2 countries are possible, Portugal or Russia, to me Russia (because of some details given to me in Garabandal) to others Portugal. That Time, the Time of the Consecration, the disaster around the World will be such than even other leaders of different religion will asked for this Consecration and could even join the Pope for that unique event, this is what I have been told, the sources looks good to me, probably some of the greatest Fatimist on this planet, 2 of them are French, their works helped me a lot for my own research about the 3rd Secret. My puzzle of the Secret is close to be finished, I may have a last trip in Fatima soon, my works confirmed that Vatican II was indicated by our Lady in the Secret as the Garabandal Prophecy of the Popes (this Prophecy was the main reason why Rome did not approved Garabandal), strong tribulations during the pontificate of the last Pope before the Consecration, a Pope under the control of evil forces as a spiritual chastisment what we are probably living currently and guess what, which only Pope since 1917 consecrated his Pontificate precisely to our Lady Fatima, the one of the Secret, thanks to the Holy Spirit for giving us his name, only a pope who could fear being the Pope in question would need to consecrate his ponfiticate to our Lady of Fatima, thinking then to get a protection from Heaven, the trap worked well. My friend Aviso, our argument never was about that… We don’t needed anybody to tell us that in a conversation between a Pope and a President of Russia, they have discussed Fatima. How could they not discuss that? That’s an unavoidable diplomatic topic in the agenda of every Pope and every president of Russia from many years. Our argument it’s about the myth of the converted Putin to Our Lady of Fatima (the President of the “converted Russia”) “asking Pope Francis to consecrate Russia to the Immaculate Heart of Mary”. Also, never was my objective trying to prove you that I am right and you are wrong. I would be very pleased to tell you I’ve found any evidence of that rumour, and I mean it. Why? Because the prophecies of Fatima have a chronological order: 1st) Consecration of Russia to the Immaculate Heart of Mary; 2nd) The conversion of Russia; 3rd) A Period of Peace. If I ever find any evidence that the “Immaculate Heart of Mary” has triumphed in Russia, any however small (devotion on their liturgical calendar, national holiday, patroness of local parishes, schools, speeches of the Russian priests and bishops and from Putin as well, the pilgrim statue of Fatima going around the country, etc.) I will be very pleased to tell you. Because if that conversion has happened already, we don’t need to worry anymore, that means that the consecrations performed in the past were valid and we live in the foretold period of peace. It has a deep meaning this “Immaculate Heart” concept. Once we start to figure out what that means we realise that it is an intrinsic Catholic devotion, a confessional and identity factor of differentiation between Catholic and Orthodox Christians. Ironically, by opposition, the orthodox understand it better than the Catholics. I won’t go any further in this discussion, I promise you, and actually I must admit that I would love to agree with you, but I can’t discard the evidences… However, this is your house and I don’t have the right to come here and tell you what to believe, it’s up to you. You know my opinion and where I’ve set up my tend lately. It’s a shame I can’t come for a few ‘Sagres’ or ‘Super Bock’ (google it) this Sunday. We have to win this time, we’re going to play at home! Please correct me in my last comment, I meant “it’s a shame ‘you’ can’t come for a few”… Thanks. Steering clear of the Putin/Francis controversy. Please accept my opinion on a slightly different but nevertheless equally important aspect of the current topic. In my opinion Fatima and the promises of the Immaculate Heart including the Consecration of Russia need to be seen against the revelations made known at Garabandal; specifically the Messages. Any successful consecration of Russia at this point in our salvation history, would have serious consequences for Garabandal by the creation of an either/or situation but not both. Garabandal would no longer be necessary and Our Blessed Lords words to Conchita [1965 locution] declared false. Recall that the purpose of the Miracle is for the conversion of the WORLD including Russia. The enormity of this fact is yet to be fully realized and adds to a state of confusion amongst many followers of Marian apparitions. The Messages hold the key. Note for example, the reference to ‘many BISHOPS in the road to perdition’ this passage effectively ruled out any chance of a valid consecration of Russia from 1965 onwards, pending complete union of the world’s bishops with the Vicar of Christ; most likely at a future Vatican Council. The late pope John Paul II gave us a hint at Fulda Germany in 1980, replying to the question ’Holy Father, when will you renew the Church? He answered: ‘I can’t until the Virgin comes again’. In my view, although not spelled out directly, that reply was a reference to the Holy Virgins future appearance at The Great Miracle above the Pines at Garabandal. Interestingly, and as readers of this blog are probably aware, Pope John Paul II took a deep interest in the Messages of Garabandal urging their promotion and entry into the hearts of the faithful before it’s too late. For all of those having doubts in the midst of a deeply troubled world I urge hope and confidence in the Holy Virgins Messages given at Garabandal and even better; make them a blueprint for your daily lives. Hi Basto, for the match tomorrow you have no chance according to my information we will win 2 / 0. For the rest end of the topic, thank you. (2-0?) Il vaut mieux faire que dire. I’m sorry my friend. There are only two cities in the world with more Portuguese people than Paris, those are Lisbon and Porto. Be careful, they can be very annoying. If football was our biggest problem, the world would be fine. Next month we will count a biblical number of 42 months since our beloved Pope Benedict XVI resigned. There were many incredible things happening in our Holy Church since then, we have to admit it. They are so incredible that if anyone could have told us only half of them, in that February 2013, no one would believe and now everything seems so normal… Very funny times these we are living in. You are right. If people were told…well, people were told by God a great deal of what would happen, in very specific detail regarding all of incredible events re the Holy Father Benedict, Francis and what he would do to the Holy Catholic Church. And yes, people didn’t believe it- so incredible, almost unbelievable and inconceivable did it sound. And yet it came true, all of it, letter by letter. Do you know why? Because indeed God does nothing without revealing it through His prophets first. And true prophecies are fulfilled. Sometimes quickly, sometimes much much later, but happen they will. Our Lady and Our Lord never prophesy in vain. Thank you Basto. I understand what you are saying. What I am saying is that 3 years (actually earlier- 5 years ago in 2011) I knew exactly what would happen in the Vatican due to very accurate, specific prophecy. And I know what Francis will be doing in the future. One example is that he will change the words of the Liturgy, and eventually ( or simultaneously) this will also involve the words regarding the Eucharistic Sacrifice. He will also work in partnership to bring in the One World Church. When I told a priest he said to me “No Donna, he can’t alter the words of the Mass. He can’t do that.” I have no reason to believe that won’t happen as every other prophecy came true. We need to be prepared to practice our faith, in the traditional and valid form, in secret- underground or at least in small groups- by a sympathetic priest who will not follow the orders for the changes. However, like in Garabandal, Fatima’s prophecies have a chronological order, no one would accept, for example, a “miracle” (2nd) before the “warning” (1st). What is more likely is to be a next Pope (Peter the Roman?) the one who will consecrate Russia and will restore the holy and religious institutional power in the eternal city, with the help from Russia. This power of Rome is getting weaker every day since 1960 and completely crushed since the 13th day of march of 13th year of this century. Then again, if we go deeply on the meaning of the “Immaculate Heart” concept and its catholic routs, the final and foretold “triumph” has to include the restoration of all Christianity – including the Orthodox schismatic churches – under the divine power of Peter given by Jesus Christ and their conversion to the Catholic Faith (only the Faith, not the rites or traditions). This is something impossible to achieve in the present scenario where President Putin and Patriarch Kirill and also Pope Francis fully reject that idea of convertion and that need. That’s a point where they all three agree, and the reason why Pope Francis shall be probably the first Pope invited to visit Russia, to go there and talk about the “encounter” and openly reject the need of “conversion” asked at Fatima. No matter how much our Holy Church is being ridiculed, and how much She bleeds because She is the one, “extra ecclesiam nulla salus”. Have a nice weekend my brothers. Thank you for another pointed analysis. I share fully your excellent summary of events as they are now unfolding. Seems to me we are nearing the threshold for the fulfillment of the major prophecies; with uncertain times ahead of us. Looking back on past events over forty years, I am constantly encouraged by Cochita’s memorable words reminding us that everything the Holy Virgin told her had come true. Please pray for her and her fellow visionaries that they complete their assignment in fidelity to the Divine Will. 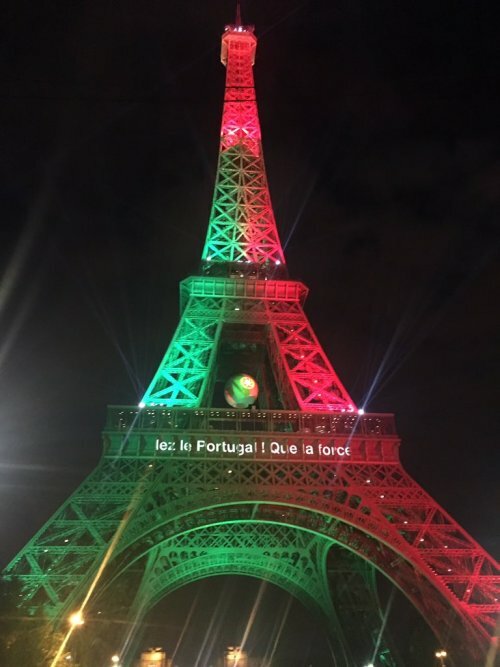 Hi Basto, you win the Final, so congratulations, I prefer to lose againts Portugal, our brothers than anyone else, you deserved this Victory, enjoy. Aviso, if you are not already aware, the Tweet, entitled ‘Mass Protests Erupt…’ Taken from the web site ‘That the bones you have crushed….’ is a misrepresentation of facts. The demonstration and the photographs on the site are solely in relation to the UK referendum concerning the EU and have absolutely nothing to do with the election of Pope Francis. There have not been any public demonstrations in England concerning Pope Francis. Furthermore I am sure Sir Bob Geldof (formally of the Boom Town Rats punk band), would have something to say if his image was being used to portray a stance on an issue he has not voiced an opinion on. The demonstrator quotes on the web page are likely to be fabricated, therefore I would not report on a site that is clearly writing fiction rather than fact. Hi Pete, it’s some humor (as a fiction) from the author which I know well (a devout Catholic) to remind us how the situation is ridiculous in Rome, some humor during these dark times is welcome, thank you. A young reader asks, “Who will apologise to my parents? My name is Michael, I am 12 years old. My mom has been homeschooling us, my two sisters and myself for 6 years. My youngest brother (3 years old) will also be home-schooled. My parents have sacrificed so much for us to have a better education than the one offered in the schools, but most of all to protect us from the evil that was and is being taught in the schools. I see my mom sometimes cry and she apologizes to us for the world the way it is, that we cannot have a childhood like she had. We tell her she doesn’t have to say sorry, it’s not her fault. I do not understand what is happening in the Church, I just know it is not right. Why do we have to apologize to people who say they are lgbtqrstuvwxyz, because I know God only created two genders, male and female, and He blessed them. So they choose to go against God. I don’t understand why people clap in church, I don’t understand why they talk and laugh while Jesus hangs on the cross up at the altar, and looks at them from the Tabernacle. I may be a kid, but who will apologize to my parents for having to sacrifice everything to keep us from the evil of this world, who have sacrificed everything to teach us properly about God, about His Church, to teach us to stand up for what is right even if it means we might not have any friends? Who will say sorry to my parents especially my mom, who has gone to meetings with teachers and principals and written letters to the priests and cardinals, so that they might change something at least in the so called catholic school, so that we could go without being looked at like weirdos? We went back last year for 6 months and it was not good, at all. We will be homeschooled for good now, which means my mom has to stay home with us all the time, my dad has to work longer hours because he is the only one working to support us. Who will apologize to my parents, will you Pope Francis? My name is Michael and I love God and I love my parents and I hope that there are still good priests and bishops and cardinals who will do something to stop this evil. Ps. I got permission from my parents to write a comment. If it was up to me, I would excommunicate this Pope and his followers ipso facto, I am serious but be sure Michael, they will not be able to cruxify the Lord again. Laudetur Jesus Christus! Aviso, when will the New World Order Church arise in your opinion? Do you think it´ll be even this winter?The situation is untenable here.Young Catholic people have given themselves over to the materialism and hedonism. Hi Frank, the new World order church as you call it is already at the top and in progress, their time and according to my sources will end next year in 2017, probably the most Dangerous year for centuries. I thank God you speak, Aviso. This is very serious. The effects of these heresies on souls and even on whole societies and their lawmakers are profound. The world has changed so much in a short time. We must never lose hope! It is the promised Triumph of Mary’s Immaculate Heart that, like all other prophecies, will be fulfilled and we must be ready to welcome that and to bring in her reign. If we are not working towards this end in all the ways Our Lady has taught us and if we are not reaching out to save the lost and misdirected, then we as lost as they are. We cannot ride on the words of prophecy for the sake of tittilation or for the smug pride of being ‘right’ or even just to save ourselves. Nor to remain comfortable in our circle of practising Catholics. We are privilege to having heard, found and believed it so that we may be the good servants who work hard to bring in the harvest. Each soul is do precious to Our Lord. Each prayer so efficacious that we must not rest from doing good. Thanks Donna, I will never forget 2 years ago in the village of Garabandal, my meeting with one of the main eyewitness of the Apparitions, a close member of the seers family, probably one of the most aware person in the village of Something uknown to most yet, I came back from the Pines then she saw me and reminding me my weeding in the village, she was one of my guest, then she starts to talk, I could not stop her, she wanted to talk, about 2 hours, unfortunately for me and especially for my sleep, since then I am not the same anymore, we are facing a very big change, probably the most biggest change since the Passion of the Lord, let’s Pray. It has touched you profoundly. And because you believed. It has also kept you keen and alert for God. I will remain listening here. I will share the burden of prayer with you. Aviso my friend, we are all very disturbed with everything that’s going on, and thank God we can still be disturbed. That weekly scandal average has been highly multiplied lately and that must have a meaning as well. But don’t let yourself forget the reason why you run this blog. Basto are you worried for your Brother ? so Pray for me, if you are worried for my security, as you know I am taking care of my security myself, family included, those are dark times, we need “soldiers”, soldiers of the Lord with the love and Prayers of the Lady, all should be fine. By the way thanks for the video, I don’t know this website, garabandal.it but will ask some friends in Italy to give more détails, it looks to be a fondation and so on, so we keep in touch. Your opinion about Russia did not changed as well, this is our main difference but you will join me probably soon, as for this Pope 3 years ago, as you know I still think to be well informed so let me thanks them again, brothers (my sources) may your Names be blessed in Heaven. We’re all disturbed, that’s what I said. I am, very actually. And plenty more creepy signs… But if your private sources have better information than what we get publically from the Interfax-religion news site, that can only give us some hope. After all, that’s what we have been waiting for 99 years, the conversion of Russia to the Immaculate Heart of Mary. Regarding to the rest, my brother, keep on the fearless work in deffending our faith. We are so few… God bless. The next Pope’s video with the prayer intentions for july shall come out after the 6th of july. I bet you that it’s not going to be this time yet that we will see clearly a crucifix or that we will hear him saying that Jesus Christ is the only God. We won’t hear anybody apologizing for forgetting to mention the Mother of God in the crazy video of May about women. And you know what? Everybody will love it! There are more, but the answer is ZERO! And you know what? Everybody loved it! That’s why we get disturbed, and thank God we can still have that feeling! On that one from 25th of September, last year, we even got this extra bonus from Shakira. Hi Basto, Interfax ? forget it Brother, you are suprising me, I was expecting more from you but I know that you can do it, if you were waiting for the good time then in my opinion, it is time. Are those news from Interfax a hoax Aviso? If you Know more please tell us because Interfax News Agency, (good or bad, I don’t know) it’s one of three main international news agencies from Russia who support Putin’s policies and the main one who covers the ROC hierarchy events. Those news, as some other similar ones, aren’t that new and they have never been disproved. I will use this article to give in Public more news especially about Garabandal and Fatima Prophecies, stay tuned. In 2013, some sources in Rome told me about a kind of deal between this mafiosi group and Bergoglio, they call it 4 years no more or 2013 to 2017, the main goal is to distort the Catholic traditional marriage by attacking it, allowing the Eucharist to anyone and especially to sodomites and divorced/remarried and so on, 4 years then the next Pope from the same circle will end their diabolical plan, probably allowing women Priests as gays Priests, I was wary that time but my sources are known to me for years so I chose to be cautious with this Pontificate from the beginning, today it looks that they are following their plan step by step. According to some other details very sensitive and given to me recently, it looks that a new Pope or a new Conclave due to the current situation between Cardinals, probably about 30 to 40% are heretics, so a new Conclave might be impossible in Rome de facto a new Pope after Francis looks unlikely but the Lady in Fatima told us that at the end the Pope will consecrate Russia to her Immaculate heart, this consecration could happen in Russia according to the same sources, but by which Pope ? Pope Benedict and this would explain why he kept his Papal Name as his Papal clothes, in any case Russia is the Key, as you know I am not afraid to Speak, not yesterday, not today as not tomorrow but time will tell only. So he feels or he knows ? that’s the question, to me we may have an answer quite soon now, some thinks about next November, so let’s see, maybe for the welcoming of Hillary.